Sanctuary Award - Station 19 Architects, Inc.
We say it all the time. Every project we work on at Station 19 is unique because every church’s vision is unique. We partner with churches to help them reflect who they are in the space they create for their community. It’s what makes our job great. Each project takes on a look and feel of its own, and we get to co-create something beautiful in partnership with our clients. Every once in a while, a project comes along that gives us a perfect picture of that partnership; that gives us a distinct challenge to address with an exciting opportunity to be creative. Meet Sanctuary Covenant Church in North Minneapolis. If you visit this church, what you’ll see is a building site and design that both reflects and refreshes its local community. Located in the heart of North Minneapolis, the church wanted a new building that would honor the local landscape and culture while shining as a center for hope and life for its surroundings. For their location, together we selected an underutilized site with condemned & empty buildings. One of the buildings on the lot was salvaged and renewed — a heavy block warehouse building — to become the new, bright, spacious lobby for their new worship center. It references the area’s industrial roots with exposed structure but brings new life and design with it. 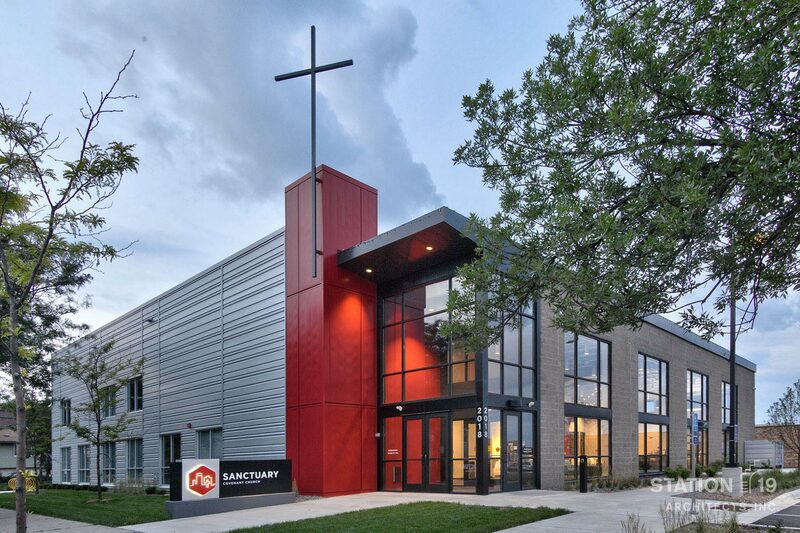 The new church building serves as a transition between a residential neighborhood & West Broadway’s commercial corridor, and it captures Sanctuary Covenant’s heart for North Minneapolis. When the work was completed, the finished product was beyond our expectations. It reflected everything we love about what we do and everything that the people of Sanctuary love about their neighborhood. We were glad to see that we weren’t the only ones who felt that way. In early August, judging took place of over 100 projects that had been entered in the Association of Licensed Architects 2018 Design Awards Program from firms around the country. Station 19 Architects decided to enter Sanctuary Covenant’s new facility into the running. With a facility that refreshed its surroundings without forgetting history, we knew that this story was worth recognizing. We knew that this church was unique and that its vision for the neighborhood was captured in the design, layout, and architecture of their new building. Of the 105 projects entered, there were 25 winners. A panel of five distinguished architects selected Sanctuary Covenant Church as a Silver Winner for Design in the category of Churches/Religious projects. This honor, given to us by colleagues in our industry who appreciate innovation, efficiency, and creativity, is a reflection to us of the potential in every church’s story. And it’s a reflection of the beauty in Sanctuary Covenant's commitment to their vision. We could not have won this great honor without the unique vision and passion of Sanctuary Covenant Church. Our experience gives us the ability to create and innovate. But it’s the vision of an organization we partner with that makes success like this possible.